For my next book due to be released in the Spring of 2014, I’m currently researching nonprofits that utilize text alert campaigns to mobilize supporters and donors. 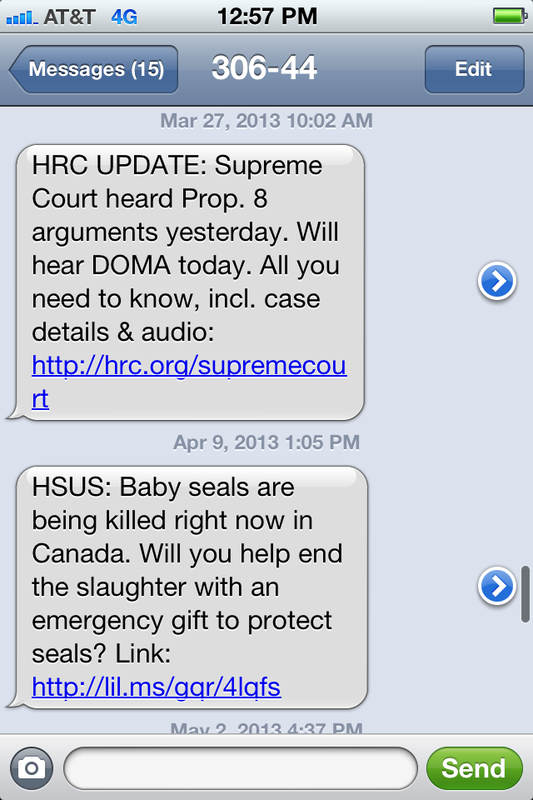 If your nonprofit is experimenting with text alerts, please post your short code and keyword pitch [such as, text HRC to 30644] – or a link to your website where potential subscribers can enter their mobile phone number – in blog comment below. I’m looking for nonprofits that excel in their use of group text messaging to be featured on this blog and in the book. I’ll subscribe to your text alerts and for those nonprofits interested in utilizing text messaging, I’d highly recommend that you subscribe as well so you can learn from those nonprofits that are pioneering text alert campaigns. Thank you. ← [RESEARCH] How Has Social and Mobile Media Changed the Way You Donate to Nonprofits? I home you are looking for nonprofits like mines for your next book. If not for your book, but at least to help me to help this worthy cause.I have been to to learn all about the text alert campaign, I hope I have stumbled on you guys for a reason. It is OASIS for children. we are small non-profit that is run out of Somerset,NJ. We may be small in size but we have a big heart and a big vision to make big changes in the country of Haiti. Not only do we have an orphanage in Haiti we educate over 25 children, who would never afford to go to school. We do mass feedings and mass clothing of the rural (severely impoverished) communities located in the outskirts of the nations capital (Port-au-Prince) donations have dropped we need to put some things in place to raise funds to keep the doors or the orphanage opened. I would love to find out all I need to know to run a text alert campaign.